My Swift / iOS9 framework 'viewer_protocol' uses another and external Objective-C framework (CocoaAsyncSocket). I'm using Carthage to build CocoaAsyncSocket. So far everything works fine: In have an example App inside my framework Xcode Project using my framework without any problems. //! Project version number for viewer_protocol. //! Project version string for viewer_protocol. What I am missing here? I'm using several others external frameworks inside my framework, there're no warnings for them - all of these external frameworks are written in Swift - CocoaAsyncSocket is pure Objective-C.
Now Xcode finds the header file and the warning disappears. hope this will help someone. who are coming here for solution. I recently ran into same issue. Apparently I had header file set as public in target membership, but it was not exposed in umbrella header. Fixed issue by making header file with project access instead of public. 2) Make sure that this file imports the missing header. 3) Build the project again, it should remove the warning. I had the same issue. Seemed to be related to old build files. 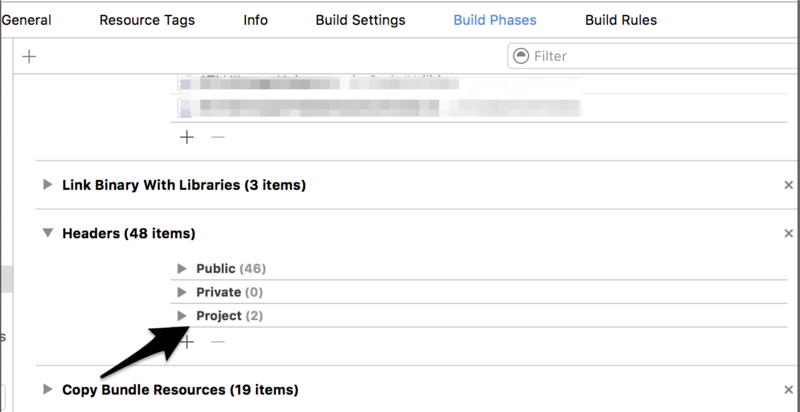 Alternatively, you may have exposed files within the Public area of your framework's build phases that should actually be moved back to the Project area. If you don't want those files to be within your framework's umbrella header so they're publicly accessible, you can revert this. Goto Framework -> Target -> Build Phases and drag to move the unnecessary header files from Public to Project. We got this recently and it was due to corruption in DerivedData. Deleting that folder fixed the problem. Then Xcode gave my this warning. Xcode is telling us that we also need to add #import "name of header in the warning> in the public header file that was created with framework, so the clients (of the framework) will know this header. 1.go to the framework public header file. (the one what created by xcode when you created the framework) . my solution was real simple but took forever for me to figure out. when i ran $ pod install it generated a workspace for me in the same dir as my .xcodeproj file. however i had already created a workspace to use as its parent directory. hope this helps someone! glhf! For me the fix was rather simple, commit all your changes and build again. The warning disappeared. Not the answer you're looking for? Browse other questions tagged objective-c xcode swift frameworks carthage or ask your own question. Why Cocoa Touch umbrella header is not automatically generated based on framework public headers? Is it okay to use a bridging header for an objective-c dynamic framework instead of an umbrella header/module map?